Grossly incompetent media reporting on research related to public health crises continues to expose vulnerable Americans to potentially lethal misinformation. 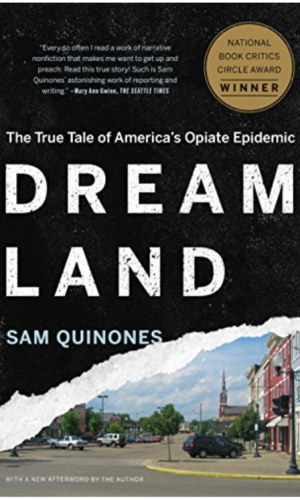 Despite mounting mortality, public health, and social costs, there is no evidence of accountability, correction, or adaptive use of the overt failure of media watchdog and evaluative roles that helped fuel the lethal opioid crisis – a collaboration, as exposed here, in reporting by Sam Quinones in “Dreamland”, of medical, academic, research, and media institutions to market fabrications driving prescription of addictive opioids for common chronic pain, a non-medical condition, without evidence supporting effectiveness or safety. Nothing has changed. 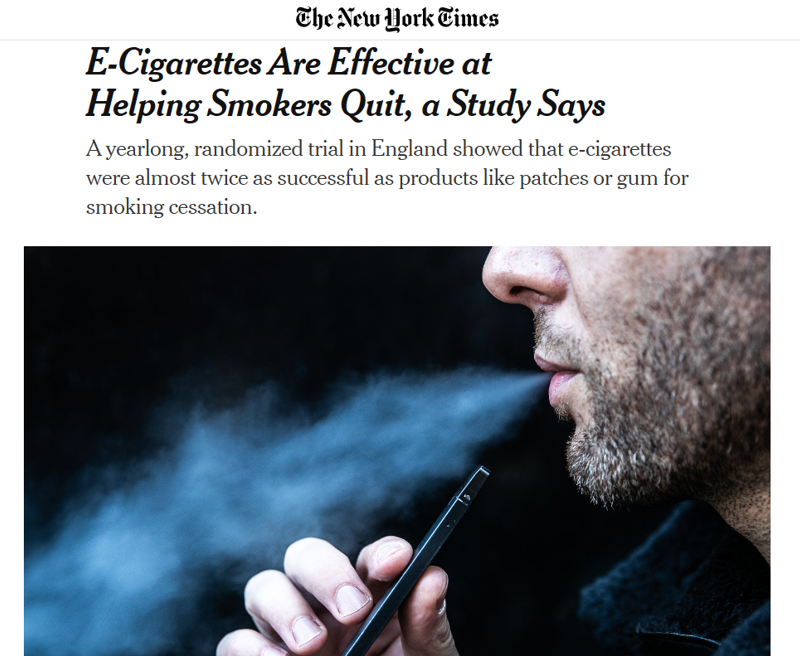 In a recent egregious example, writers at Vox, the New York Times, other outlets in ignorance of the most basic of research interpretation errors promoted entirely unsupported conclusions promoting false confidence in effectiveness of use of electronic cigarettes or nicotine replacement therapy (NRT) products as treatments for the highly lethal condition of compulsive use of tobacco by smoking. As in the media/pharma/medical industry collaboration that created the lethal opioid crisis, significant harm is predicted by the distortions and false messaging, by promotion of false confidence in unsupported treatments for smoking. 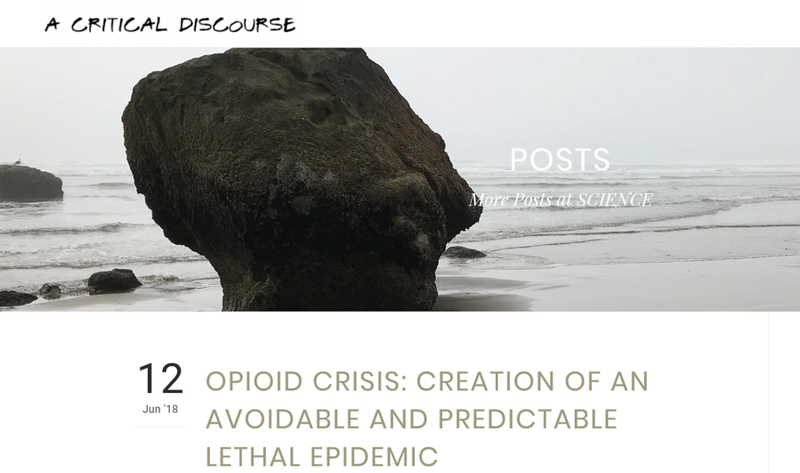 The harms include tobacco-related mortality and morbidity that eclipse that related to other drugs, and harms due to smoking linked to incidence of chronic pain syndromes and exacerbated pain perception, both factors driving opioid misuse and the opioid crisis. 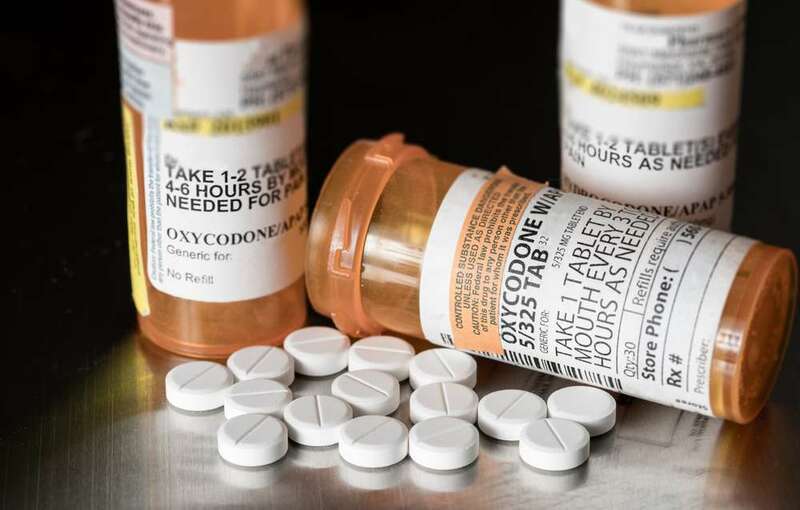 To describe adequately and accurately the extent to which American media distort, misreport and mislead vulnerable Americans on the life-and-death issues tied to opioid and other lethal substance use epidemics is a simple matter – as explained here, essentially all reporting is defined and driven by the useful constructed fictions required to support the industries and institutions that gain by using public healthcare resources to fuel worsening crises – just as in the media-medical industry-pharmaceutical-academic-healthcare institution collaboration that lied to America about common chronic pain and opioids to create the opioid crisis. Those fictions usefully rationalize, support and perpetuate practices that instead of providing evidence-based and effective prevention and treatment for the complex behavior of compulsive substance use (“addiction”), are established by longstanding evidence to predict harm or at best no benefit. Predictably, the sham “treatments” that drive profits and entitlement systems generate and perpetuate lethal epidemics, lacking effectiveness for the health conditions vulnerable and trusting Americans trapped in epidemics are assured – by medical experts and media – they are effective treatments for. Recent examples of reporting on health-related research are egregious and illustrative. Unsupported and potentially lethal conclusions constructed in ignorance of the most elementary pitfalls of research interpretation and analysis are consumed with knowing assent and approval by research-illiterate media and social media popularizers of fictions required to maintain status and cultural capital for health industries served. This Vox report on an uncontrolled research study comparing vaping to nicotine replacement therapy (NRT) for smoking cessation headlined the study as a “control” (sic) trial. But there was no control (= no treatment) group, critically and importantly determining limits of interpretation and effectiveness of treatment (vaping and NRT) effects for a potentially lethal condition that claims around a half million American lives each year, among other costs including contributing to the opioid crisis. Accurate interpretation and reporting to a public vulnerable to the harms of smoking – deaths and other harms that eclipse those of opioids, methamphetamine, and alcohol combined – is particularly important because of the lethality of compulsive tobacco use, the public health and social costs, and contribution to other public health problems . . .
What does the research say about tobacco use, chronic pain as related to the opioid crisis, and how public healthcare funds should be effectively used to support tobacco cessation ? 1. Ditre, J. W., Brandon, T. H., Zale, E. L., & Meagher, M. M. (2011). Pain, Nicotine, and Smoking: Research Findings and Mechanistic Considerations. Psychological Bulletin, 137(6), 1065–1093. 4. Margolin, M. (2017) You Can’t Treat Opioid Addiction While Ignoring Nicotine Addiction. Smoking cigarettes could increase risk of relapse into other drug use, experts say. Tonic: Nov 22 2017. The randomized controlled trial (RCT) is an aspirational standard for design of research studies to allow, ideally, confident conclusions to be drawn about whether a treatment factor is effective, for example, in stopping, preventing, or reversing a health condition – potentially answering, with replication, the critically important question Does it work? Can this treatment be confidently expected to help, to prevent harm or death, regain health and functioning? The “controlled” element is critically important and often failed in design. In an adequately designed and implemented RCT, a control or “no treatment” group ideally is exposed to, experiences, the very same circumstances as the “experimental” or “treatment” group receiving the treatment (e.g. medication, therapy) being evaluated for effectiveness – with the sole difference of not receiving the treatment. A treatment can be confidently concluded to be effective, helpful (versus ineffective or harmful) only if there are significantly more positive outcomes for the treatment group than for subjects in the control group, who may have positive outcomes due to, for example, the passing of time, spontaneous remission, placebo effect, other unidentified factors occurring over the course of a clinical trial. There is no possibility of confidently attributing treatment, or curative, benefit to an evaluated treatment (e.g. pill, procedure) without comparison to an adequately designed control group. That requirement and potential (and potentially lethal) error in experimental design and interpretation is among the most elementary and important. In the case of the recent study widely cited in popular media and excitedly heralded as providing important results on effectiveness of stop smoking interventions, published in the New England Journal of Medicine (NEJM) – that’s the journal largely responsible for misrepresenting as “research” the unsupported conclusions generating waves of fabrications needed to fuel the lethal opioid crisis – there was no control group, instead a comparison of two treatment groups: subjects using e-cigarettes to assist in tobacco smoking cessation, and subjects using nicotine replacement therapy (NRT). That’s not true. Another lethally confounding factor in this study was that there were no usefully designed treatment groups instead there was another, second, type of cessation intervention applied concurrently to each of those treatment groups – an intervention established to independently provide tobacco cessation benefit compared to actual control groups in adequately designed studies – and that confounding effect also intractably prevented attributing the ascribed and celebrated benefit to either NRT or use of e-cigarettes in conjunction with failure to evaluate external validity of the study. But more about that below. What was widely reported, celebrated, and messaged to a tobacco smoking pubic at risk of death without effective guidance and treatments in support of cessation (in addition to the overtly erroneous description of the study as a “control” trial) are claims that based on measured outcomes (smokers still not smoking a year later), NRT had a smoking cessation effectiveness of 10%, vaping 18%. Let’s consider those claims, in the context of the most elementary principles of research design and interpretation including the control group, the treatment group, and external validity. In the study published in the prestigious medical research journal NEJM, there was no control group. What does that matter? As established in multiple large scale epidemiological surveys with large sample sizes, consistently a majority of individuals with tobacco use disorder (the “disease” of tobacco smoking), as well as for alcohol, methamphetamine, cannabis, and opioid use disorders are found to stop using those substances and not return to use, most often stopping without any forms of treatment or formal support – they just quit. Accordingly, in any clinical trial it is expected that some significant portion of subjects in control (no treatment or placebo) groups will have positive outcomes – that is, they will stop use of the substance without receiving the evaluated treatment – MEANING: that portion of the subjects in the treatment group measured positive outcomes DON’T COUNT. They would have had positive outcomes without the treatment, and those cases cannot be attributed to the treatment. That’s why, in meaningfully designed studies, results are framed as, “Compared to control group . . .” or a statistical probability value (P) or 95% confidence interval for success values for subjects receiving the experimental treatment versus subject in control group – allowing confident conclusions about whether there is any benefit attributable to the treatment. In this Veterans Administration (VA) summary of research on smoking intervention trials, success rates for control groups (no treatment or placebo) tend to range approximately from 10 to 14%. To repeat: in controlled clinical trials smoking cessation success for control (no treatment) groups tends to range approximately from 10 to 14%. It’s important to note that that summary would have included trials for which outcomes were measured over shorter follow-up periods than the one year in the NEJM study. 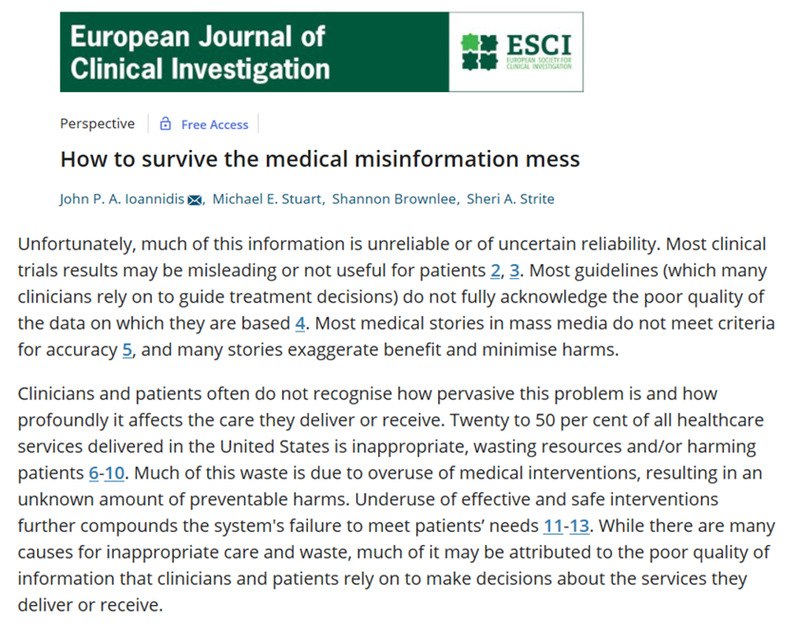 in order to protect vulnerable Americans from the type of lethal medical misinformation that, for example, creates an opioid crisis, to consider the most important and elementary aspects of experimental design and interpretation that are critical to preventing misinformation. The most current research on effectiveness of NRT, in controlled studies, establishes that benefit attributable to the effects of the NRT intervention range from clinically insignificant (negligible) to no benefit. There are many ways that research – especially when interpreted by professionals and writers out of scope of competence to analyze and think critically about research results, that is, without training or experience as researchers – can be distorted, invalid, with illegitimately drawn conclusions and potentially lethal consequences One of those ways is related to the distinction between statistical significance and clinical significance. Statistical significance refers to the method – essentially the purpose and value of statistical testing – by which a probability value (for example P=.02) represents the confidence of drawing the conclusion of a true (not due to chance in the experiment) benefit, or difference between treatment and no treatment as indicated by the chosen measure for a difference. A probability value of P=.02, for example, would indicate the likelihood of the measured difference not being “real” as only 2%, so we would have relatively high confidence in it being a real difference. It does not tell us about the magnitude of the difference or whether the difference can reasonable be expected to be gained by smokers under realistic natural conditions in their natural settings (“external validity”). Those magnitudes, or size of benefit, for Nicotine Replacement Therapy (NRT) when treatment results in a statistically significant difference, and for the other medications, are quite small, for example in this study a benefit to 3%, or 3 of every 100 people treated with NRT. Clinical significance typically in these studies is ignored, masked by focus on the statistical measures like odds ratios, confidence intervals, probability (P) values. Apart from the cost in public funds to provide “treatments” for smoking cessation with benefit to only 3 – 5% of patients treated, are there additional costs that would outweigh the very small probability of benefit from the medical-model treatment? – Effects sizes (clinical significance, or number of patients benefitting from the treatment) have always been small. For example in this study 3% of patients reporting cessation of smoking with NRT. – Additional studies (5-7) provide evidence of no benefit for smoking cessation from NRT. 5. Stanley, T.D. et al. (2016) Evidence of nicotine replacement’s effectiveness dissolves when meta-regression accommodates multiple sources of bias. Journal of Clinical Epidemiology , Volume 79 , 41 – 45. 6. Alpert HR, Connolly GN, Biener LA prospective cohort study challenging the effectiveness of population-based medical intervention for smoking cessation. Tobacco Control 2013;22:32-37. – Studies routinely combine medication in treatment groups with counseling, the combination typically resulting in more positive outcomes than for the medication alone, and disallowing conclusions about benefit due to the medication alone. – Individual counseling is effective for smoking cessation, with no indications of lack of benefit, and greater clinical significance than for NRT and medications, one review attributing an increase from 7% success with brief counseling support to 10 – 12% with individual counseling. Those results are for standard counseling for substance use, established as generally ineffective. Use of therapies supported by research and theory as effective would predict larger positive outcomes. Nor were there experimentally valid and useful treatment groups in the NEJM study, instead each of the two experimental groups included behavioral health counseling, an intervention established by research to independently predict smoking cessation success in the range of 7 to 12%, as noted. Predicted cessation success rates due to established effects of smokers quitting on their own, without treatments (in the range of 10 to 14%) and due to behavioral health therapies (7 to 12%) account for cessation rates in both study groups. 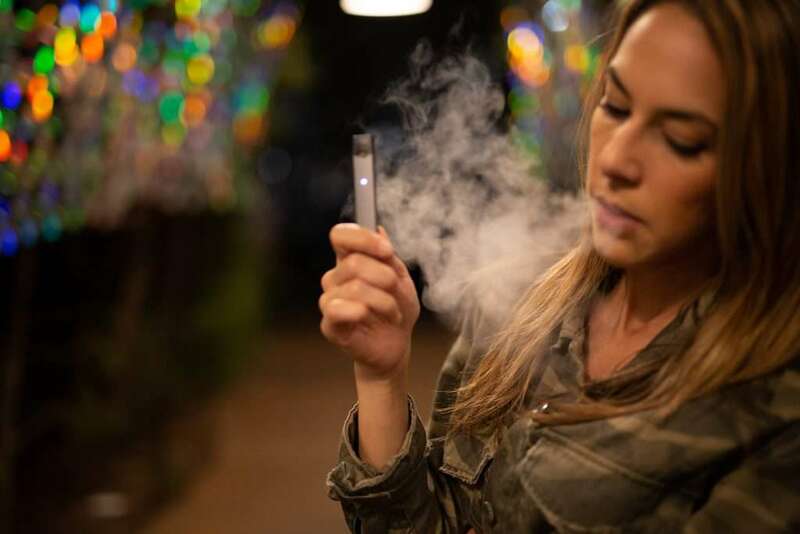 Only if success rates had significantly exceeded 20% would the hypotheses been suggested – requiring testing in replicated controlled trials – that NRT or use of e-cigarettes provide benefit for smoking cessation. Testing in replicated randomized controlled trials, with external validity. External validity is a feature and measure of the confidence with which a study’s apparent outcomes, under the conditions of the study design, characteristics of subjects, etc., and protocols, can confidently be expected to be realized in natural (community) settings – that is, in the real world where individuals are attempting to stop smoking. How many smokers switching to e-cigarettes in order to stop smoking likely also engage in evidence-based behavioral health counseling concurrently? >0? This “seminal” study, widely popularized and celebrated as significant, published in the very medical journal with the key role in normalizing the fabrications generating the lethal opioid crisis, heralded in the NYTimes as establishing an “unequivocal answer: yes” to the question of whether “e-cigarettes actually help smokers quit?” – in fact on evaluation points to a clear lack of evidence supporting effectiveness, the celebratory headlines and media accounts providing medical misinformation to millions of compulsive users of tobacco, a condition with high risk of illness and death. The difference between the fabricated outcomes, the fake success rates, versus what is supported, actually established by the results – the basis for a decision to trust and invest in as a cure, a treatment for a life-threatening condition – between an 18% chance of benefit versus zero, or close to zero, is a lot, a big difference, a life-and-death difference. The NEJM study and its pathologically incompetent and malfeasant interpretation and marketing to a vulnerable population trapped in life-threatening substance use epidemics is a single example, the tip of an iceberg, a symptom of massive underlying institutional and individual diminished capacity for critical thought, competence, integrity and ethical behavior, a predictor of opioid and substance use epidemics, of public harm. 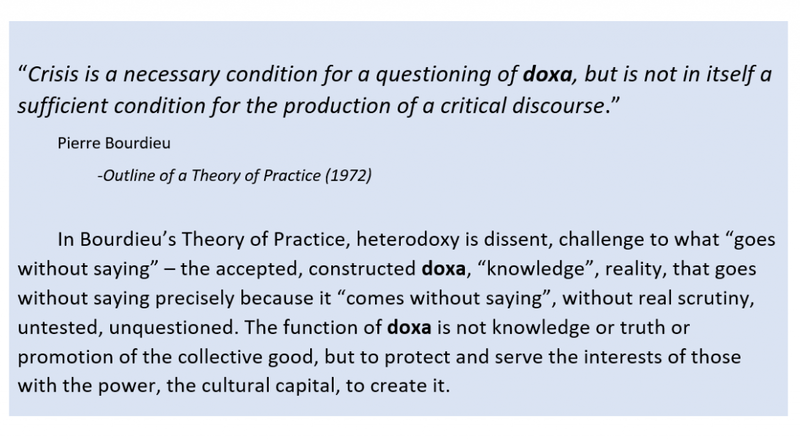 It’s a pathology that creates and runs through allowable, constructed public discourse, the matrix that informs consumers of their options, a matrix managed by and serving forces with the cultural capital to fabricate it. Website Design by C.M. and G.M.